What are you doing on Memorial Day? BHDM 2013 Camps are OPEN for registration! Goto http://ow.ly/i0pDK (GG) & http://ow.ly/i0pFO (WW). Register now–slots fill quickly! Getting ready for this trip to Colombia — in light of everything else that is going on — feels a little surreal. not sure what day it is, and it seems like one long afternoon! However, I cannot wait to see what the Lord will do once we get there. 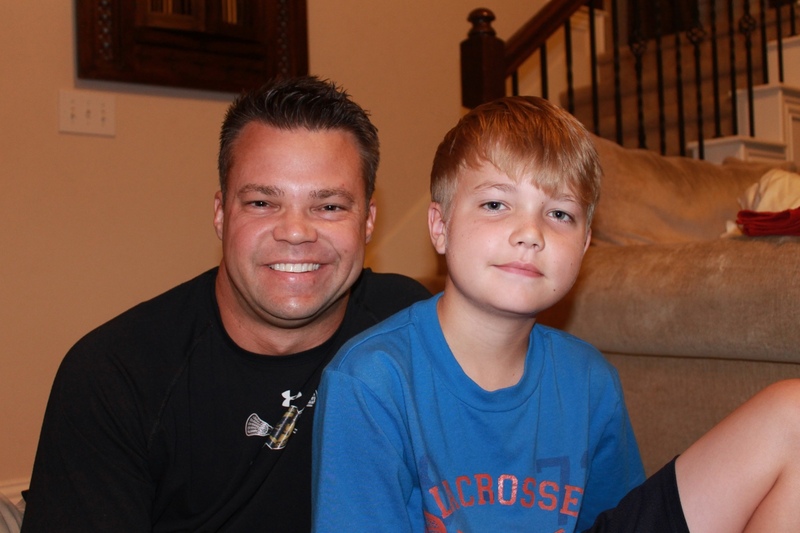 I know that He has been preparing Dylan and me forever for this mission and will possibly throw us some curve balls…all in the spirit of teaching us how to depend on Him, moment by moment. Lord, I pray that YOU would teach Dylan what You need for him to know and that I would be mindful of what You are doing in the moment. He needs all of You – and I don’t want to get in the way! * He is in control, always, no matter what. * Things are not always what they seem. What may seem like a roadblock in OUR agenda, is what He intends for His almighty purposes. Holy Spirit, make me sensitive to your leading and help me to hear your still, small voice! * Nothing happens to us/our team that the Lord didn’t at least give permission for. This is not a war between God and Satan – we are reclaiming enemy occupied territory in Jesus’ name! Lord, thank you for empowering us with your Holy Spirit and making us complete in Christ. I pray that I would be a willing participant in the plan that you have for us on this trip. Please give me eyes to see and ears to hear. Make me hyper sensitive to Your plan for Dylan as it pertains to me – use me in his life as you see fit. Please protect us from the enemy – deliver us from evil. We are kingdom warriors and are empowered by Your Holy Spirit and armed with the GOOD NEWS. I pray that we would boldly proclaim the Gospel as we should – and use words only when necessary. Make us effective conduit men for your glory. May You be glorified by our words and actions – and THANK YOU for desiring to use us in this way! X-ray vision? 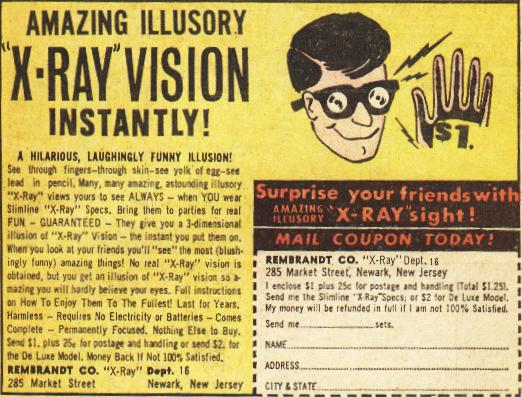 Remember the cool old school advertisements for x-ray vision glasses? Anyone ever get sucked in to sending in their allowance on these babies? The Godhead is in the business of giving sight and conversely, blinding. > You will discover the knowledge of God. When He does that…you will discern righteousness & justice & equity & every good course. HE GIVES YOU EYES TO SEE WHAT IS REALLY GOING ON! Why? …and on & on the author describes the adulteress. So, He gives us eyes to see. The ability to discern & detect the legit from the counterfeit. To give us x-ray vision of sorts…. “In science fiction stories or super hero comics, X-ray vision is the ability to see through physical objects at the discretion of the holder of this superpower. The most famous possessor of this power is DC comics iconic super hero character Superman. Though called X-ray vision, this power has little to do with the actual effect of X-rays. Instead, it is usually presented as the ability to selectively see through certain objects as though they are invisible, translucent or not present, in order to see objects or surfaces beyond or deep to the affected object or material. To go back to Proverbs 2, I guess what hit me yesterday was that GOD gives the things listed in these verses – He and He alone does. We can’t get real wisdom, discernment, etc in any other way. He must reveal it to us in order for us to get it, but we also must pursue the Giver in order for Him to reveal it, it seems. There is a definite “If…Then…” depiction. For this people’s heart has become calloused; they hardly hear with their ears, and they have closed their eyes. Otherwise they might see with their eyes, hear with their ears, understand with their hearts and turn, and I would heal them.’ (Matt 13:15). We fear to the degree that we recognize our human weakness, for it arises from trusting in ourselves, our independence, and our ability to control, protect, and provide. The greater our inferiority, the greater our attempts to protect ourselves and the greater our fears. Why do we hear so much about financial security, wise investments, paying off the mortgage, and a good savings plan? If we have no relationship with God, all these and more make perfect sense. Security is cultivated in ourselves, not in God. Man was created to trust something much bigger than himself, so when self is trusted, fear naturally overwhelms. Fear comes from not having a God and departs at the recognition of, rest in, and dependence on God. Ask what is at the root of your fear, whether it is loneliness, lack of security, rejection, hopelessness, comfort, or humiliation. Go to a mirror, examine the worry lines, look at the result of fear’s possessing you, and then break out laughing. You can afford to laugh at fear. Remind yourself, “I have a God!” Then invite fear out. Refuse it! You allowed fear a foothold through independence; now make it go through dependence on the Father. From now on fear must only enter through a revolving door. Turn it back and refuse its company. Many religions teach about confronting fear in order to overcome it. Confrontation brings our focus on it, and it remains. The Christian deals with fear by changing direction and heading back into the presence of God. In the midst of a fearful attack, fall on your knees, begin to pray through a passage that speaks of the greatness of God, let that become your focus, and immediately you will sense a lift in your spirit. There is nothing that the nearness of God will not cure. Fear simply does not suit you! ~Michael Wells (2006-06-01). Heavenly Discipleship. Abiding Life Press. Kindle Edition. This passage of Mike Wells book, “Heavenly Discipleship” has had a positive impact on me…and I hope it will last – and permeate my life from now on. Primarily, I have started to use the phrase, “I have a God!” as a reminder marker when my thinking starts to go off the rails in any situation. This is not a formula by any means, just something I’m starting to use to re-calibrate my focus on Christ. It’s a habit I’m trying to form…and, wouldn’t you know it…God is providing practice opportunities! DISCLAIMER: Again, I’m not advising a “name it/claim it” or formulaic mindset here. I’ve lived long enough to know that God’s not into formulas! This is just an “in the moment” acknowledgement that He is God and I am not. Rather than me trying to “control” the situation by cussing at it, becoming angry at it (or others around me), blaming others, etc (all of which I have done and still may initially do from time to time), I try to take a moment and tell God He is God and He has the power to deliver me from my present circumstance. Just trying to practice the presence of God. My car has always (eventually) started. The two cases have not closed (yet). I AM LEADING YOU, STEP BY STEP, through your life. Hold My hand in trusting dependence, letting Me guide you through this day. Your future looks uncertain and feels flimsy even precarious. That is how it should be. Secret things belong to the Lord, and future things are secret things. When you try to figure out the future, you are grasping at things that are Mine. This, like all forms of worry, is an act of rebellion: doubting My promises to care for you. Whenever you find yourself worrying about the future, repent and return to Me. I will show you the next step forward, and the one after that, and the one after that. Relax and enjoy the journey in My Presence, trusting Me to open up the way before you as you go. Do you have a God today? If so, join me in acting as such. Faith (in God) without works (action) is dead. (James 2:17-26) Without faith (in God), it’s impossible to please Him (Hebrews 11:6). Then, teaching them more about prayer, he used this story: “Suppose you went to a friend’s house at midnight, wanting to borrow three loaves of bread. You say to him, `A friend of mine has just arrived for a visit, and I have nothing for him to eat.’ And suppose he calls out from his bedroom, `Don’t bother me. The door is locked for the night, and my family and I are all in bed. I can’t help you.’ But I tell you this—though he won’t do it for friendship’s sake, if you keep knocking long enough, he will get up and give you whatever you need because of your shameless persistence. Persist with a sense of urgency. The parable denotes how we should persist in prayer. The real life event describes a woman who wouldn’t take no for an answer from The One who could heal her daughter. 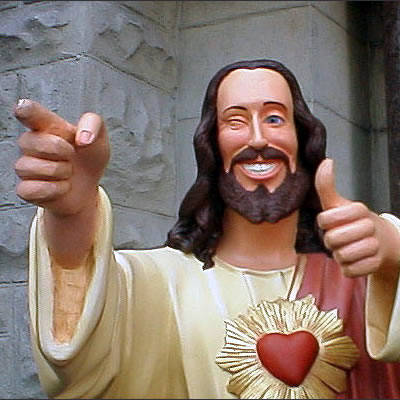 I find that I either drop the subject with Jesus too soon, or I never start the conversation with Him at all. And, when I do converse with Him it is not with the sense of urgency that either of these above installments describe. What does that say about me? What does that say about my belief in Him? I guess it is selective at best – which frustrates me about myself. I have watched Jesus do amazing, life changing things in my life and those around me as well. However, I am quick to forget…which mainly just makes me human. But now, I’m empowered by the indwelling Holy Spirit – and I shouldn’t forget so easily! I must focus on Him – fix my eyes on Jesus, the Author and Perfecter of my faith; strip away all that easily entangles me so that I might run the race of life well. This race is not a sprint and then done…with rest/relaxation at the end. It is a ultra-marathon that I am both training for and running at the same time (It is all on the job training!!). I am weak, but He is strong. Again, where is my focus? Is it on my weakness? Or is it on Him? When focused on Him, my weaknesses don’t go away, but they are no longer my focus. AND, His strength is made perfect in (my) weakness. Bonus!! Both of the passages above deal with relationship strength. The parable says that the asker and the askee are friends. The real event describes Jesus coming (initially) for the Jews not the Gentiles, so…sorry, no healing for you. But – the friend and the woman both were fixed on the fact that they knew they were talking to the right person who could help their present situation. They are not deterred in the slightest. They don’t go somewhere else to find a “band-aid” solution to tide them over. They need the maximum help and they need it now. They do not stop until they are eventually satisfied…but it is not right away. They both felt as if they knew exactly what they needed. Were they focused on the outcome they needed/wanted or on the One who could give them the outcome they “needed”/wanted? When I do this – how does it make me feel? Accomplished? Justified (maybe this is what sets me down the above manipulation path in the first place)? I think probably, it makes me feel a little hollow? Instead, let’s say that I drop everything, turn and focus on Him – pray like my very life, or the life of my wife, daughter or son depended on it. Am I guaranteed the outcome I think I need? In the above passages, those who asked were not guaranteed the outcomes they thought they needed and did eventually receive. They just knew beyond the shadow of a doubt that they were asking the right Person. The One who could – if He so chose to – could right the wrong that they were experiencing. even though I have received such wonderful revelations from God. So to keep me from becoming proud, I was given a thorn in my flesh, a messenger from Satan to torment me and keep me from becoming proud. Paul was a very persistent guy. He was a zealot! This was a character trait that God wanted/needed in the person He would use to spread the Gospel to the Gentiles. However, He finally does the “spiritual judo” thing here, and takes his “no” answer he receives (to the outcome he needed/wanted) and then thanks God for the thorn he wanted removed! We don’t see that he pouts or gives God the preverbal finger because he didn’t get the outcome he wanted. But here is the similarity to the first two examples: Paul went to the One who he knew could change his outcome. He was not guaranteed that he would get what he came and asked for, but he begged the One who could right the wrong he was experiencing. In that time conversing with God, Jesus spoke to him in a way that changed Paul’s outlook on the whole situation. He’s it. The time focusing on Him, begging Him, crying out to Him, doggedly pursuing Him like He’s the only One or thing that can right the wrong I may be currently experiencing will not come back void. He will either change the outcome to be what I came asking for OR…he will change my outlook on the situation. Either way, He’s the right Person to go to. Faith in Jesus requires action (faith without works is dead). Lord Jesus, please create in me a desire to put my self to death and come to You first. Seek You first. You’ve made me very capable in many ways but this can be my thorn/obstacle in seeing that You are my Answer to every question, every time. I will get this wrong some more, but thank You for accepting me as I am and loving me enough to shape and mold me (even thru problems and circumstances I hate!) into the child of God you see me to be. You see me as the perfected and finished work already! The rest of life is just chipping away the pieces that aren’t necessary. Please help me to not cling to those pieces like grim death. I choose Life! !